I guess I'll start at the beginning. 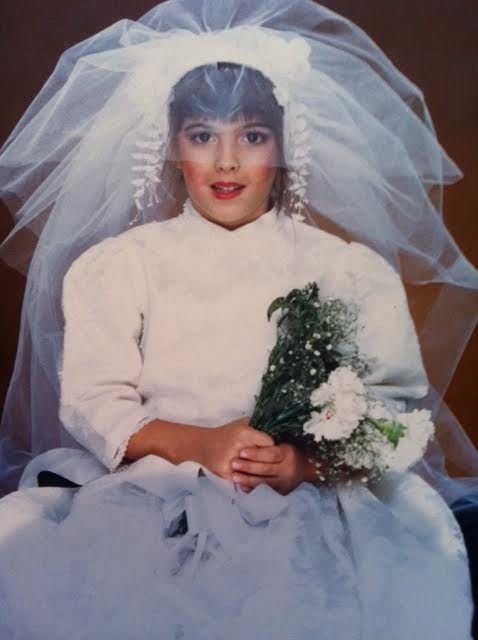 Yep...that's me as a little bride all dressed up on Halloween. The obsession with weddings started young. It seemed as though I came up with something and wouldn't let it go, just like how I asked Santa practically ever year for a baby (took a while for that one, hi June). Father of the bride came out in 1991, I started my subscription to Martha Stewart Weddings and flash forward I'm in college studying event planning under hospitality darling, Kendi Root. Four restaurants, three hotels, two golf courses and a candy company later, I'm finally in Napa, the mecca of weddings in my opinion. For those that know me personally know that beyond events, I have a passion for food, family, home design, and wine, plus a million more things but I think those would probably be what I obsess on most. So in addition to blogging about event trends and bridal tips, this wouldn't be an "Anne" blog without recipes, restaurant recommendations, baby notes and pictures of pretty kitchens. Basically: a smorgasbord of happy!